With its portico designed by Brunelleschi, its decorative tiles from the workshop of Della Robbia, its nine well-proportioned arches, each topped with an elegant tabernacle window, the Ospedale degli Innocenti is one of Florence’s most-scrutinised, most-photographed buildings, often claimed by tour-guides to be the earliest example of Renaissance architecture in the world. But it is only by passing under the portico and coming closer, leaving the traditional tourist route behind, that the story behind the famous façade becomes visible. Then, standing under the portico, two things emerge: a strange barred window set into the wall, and – on some clear mornings – the faint voices of children. 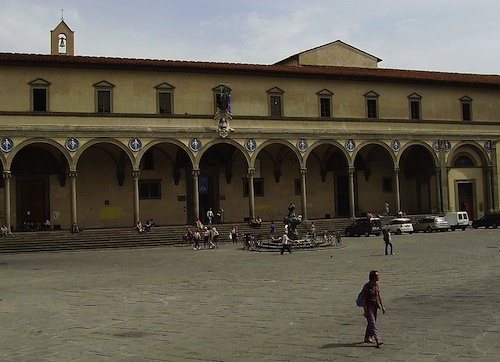 Their story, the lives they lived in the stucco chambers and dry courtyards behind the portico, is a story that is mostly unknown outside Florence. And yet is in such overlooked spaces that the most important stories often dwell. It was here, on a cold November morning four years ago, that I found a way into the particular story I was trying to tell. I came to Florence not as a tourist but as a gradual immigrant to Italy, arriving first for extended stays with my Italian family-in-law before moving permanently in 2015. It was on one of these extended visits that I first discovered the Innocenti. At the time, the building’s museum had been closed for refurbishment for almost a decade, and its façade was half-obscured by scaffolding. 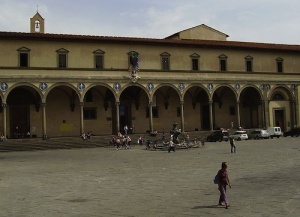 All that remained open was a small temporary exhibition, housed in a room off the Piazza della Santissima Annunziata. It was to the door of this room that I came, one morning in November 2013, vaguely searching. Troubled by the aftermath of the financial crisis, I had been searching for some way to write about it. I had conceived the idea of following one family, and one family business, on a tiny island in the Mediterranean or perhaps in the very north of England, a family whose home and history would be thrown into disarray by the events of twentieth-century history, and finally by this crisis of our own century, and would attempt to survive it. The American writer Ann Patchett has described the process of starting a novel as like “breaking into Fort Knox with an emery board”. As the material you have gathered becomes an edifice that is more and more elaborate, you pace its walls, searching for a way in. This was roughly what I was doing when I arrived at the small door of the great Ospedale degli Innocenti and went inside looking for some keyhole, some point of light. The exhibition room was unheated, and I was the only tourist. I found a stone store-chamber without windows, with a few warped display cases pushed up against the wall, the air colder than the square outside. Nevertheless, I studied the small objects displayed on squares of curling paper – water-stained ribbons, tin medallions cut in half, handwritten notes bearing the names and baptism dates of nineteenth-century children. These objects, I read, had been bundled up in the swaddling-clothes of abandoned infants. Some mothers would snip a coin in half; others would remove a piece from a paper cut-out, or carefully bisect a ribbon, keeping one half and pinning one half to their newborn child. These segni were the means by which they would reclaim their children. Looking at the pitiful objects, the carefully preserved trinkets and beads, Saint Christopher medallions and water-stained ribbons, I bent closer, captivated, understanding that I had stumbled upon that rare and mysterious thing: an untold story belonging to the past. 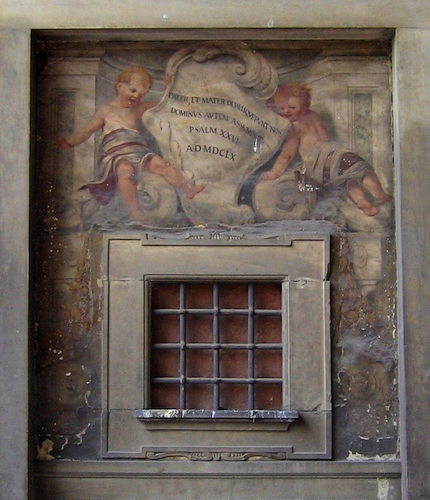 This ‘grated window’ is the only trace that can still be seen beneath Brunelleschi’s porticoes: a nine-barred opening like that of a prison cell, surrounded by faded saints and angels. Through this window, children were unceremoniously shoved, to be deposited on a cushioned plinth or, by some accounts, in a crib between lifesize figures of St Joseph and the Virgin Mary, while whoever had abandoned them escaped unseen. It was so small that only a newborn (and even then, only with some contorting, perhaps) could be shoved inside. And yet this story – as I soon discovered – was not just a historical curiosity pertaining to a handful of children who got left behind when the city boomed. Instead, it was the story of an astounding number of the city’s citizens, living and dead. In the following days, as I progressed deeper into the hidden courtyards behind the building, I understood the scale of the story. In the archive, I studied the great yellow books of Balie e Bambini (wet-nurses and children), in which each foundling’s life and death was meticulously recorded (beginning with ‘Agata’ in the mid-1400s). In the institute’s library, I discovered that at one point in the nineteenth century, in what was a particularly intense period of child-abandonment across Europe, the Innocenti was receiving a third of the city’s children, sometimes five or six per day, each heralded mechanically by the ringing of a specially-installed bell. Wet-nurses were employed in the hundreds; children were farmed out to foster-families and apprenticed to artisan guilds on an unprecedented scale. To the tourist with one day to see it, Florence appears a twilit, glittering paradise. Instead, I discovered a city with a profound, centuries-long crisis at its heart. And perhaps more remarkably, I also discovered that the Innocenti – quietly, unostentatiously – had been trying to do something about that crisis for almost six hundred years. There were no tales here of exploitation and murder, of the crimes perpetuated by villains like England’s famous ‘Coram Men’, no accounts of Dickensian neglect and indifference. The famous Renaissance architects and artists who constructed the building did so for the express purpose of housing the children. 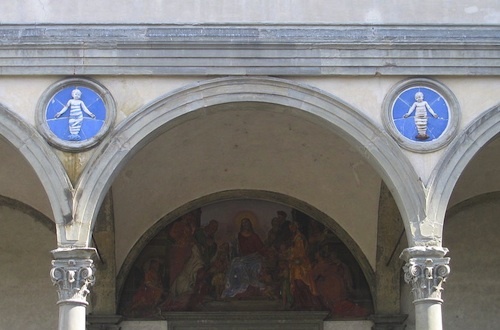 It was for the children that the ornate façade was designed, that Della Robbia created ceramic babies for the hospital’s façade, Botticelli donated paintings, and Ghirlandaio painted an altarpiece. Other benefactors paid for the children’s education. Wealthy artisans and merchants adopted them into their families. In the museum’s collection is one particularly striking painting, by an anonymous Florentine artist, in which the Virgin Mary shelters young foundlings in their school uniforms: the larger ones in black cloaks with babies embroidered on the chests, the smallest swaddled in pink and white. Each of these babies is painted with the specific features and expressions, some peeved, some vacant, that make you believe they were drawn from real children. This is probably the case, for once inside the iron window, the abandoned children received rigorous care. They were examined, and their details recorded. They were cared for by a rotating team of doctors from the local surgical hospital. They were sent to wet nurses in the country, educated, and often adopted by new families; later, they were given dowries or apprenticed to trades. Look a little closer, and the city’s history books are full of illustrious names labelled, in parenthesis, as ‘sons of the Innocenti’, or simply nocentini. Each of these names, it turns out, is a foundling who went on to become a city official, an artisan, a businessman, an artist. (There was also a cohort of female foundlings who lived their whole lives inside the institute, receiving room and board, caring for the new arrivals). And this is a history which is not yet finished. Over the centuries, the Innocenti – the first purpose-built institution for the care of abandoned babies – became a European leader in childcare research and practice. In 1900, the institute was awarded a place at the Universal Exposition in Paris. Here, photographs of the hospital were displayed to the world for the first time: well-organised offices and nurses’ kitchens, gardens, classrooms, specially-aired terraces and observation rooms for sick babies. Nowadays, UNICEF’s Office of Research is located at the Innocenti, and the institute still runs day-care centres, a facility for children in temporary crisis, and projects for teenagers and vulnerable families. On any day a hundred or more children might pass through its doors, mingling in the ancient courtyards with the academics and archivists. In 2016, after more than a decade of refurbishment, a new museum at last threw the doors of the Innocenti open, and let in the tourists and the light. By this time, I had already read everything I could about the Innocenti, and it had become the emery board with which I broke into the Fort Knox of my story. In telling the story of one foundling from the hospital, who eventually became a founder – of a house, a bar, a family – I discovered a way to write about what home and identity had meant over four generations of young Europeans during times of historical crisis, an alternative history in which the small, untold stories, those that take place behind the elegant façades and gorgeous palaces, became the focalising lens through which the rest of history passed. As a visitor to a city like Florence – to a country as ancient as Italy – it is hard sometimes to get beyond the architecture and the camera lens to the real history within its walls. How do you get to the heart of a place so ancient, so multilayered, so clamorous with past voices, and yet so quiet and walled-off, its past lives so remote from us now? In what hidden courtyard or fountained piazza can you possibly pass behind the glittering facings of art and edifices, and understand the lives that were once lived there? The new Museo degli Innocenti is one such place. Pass through its airy entrance hall, descend the basement stairs into its old store-rooms, now spotlit and hung with fine paintings, and you will come to a semicircle of a hundred and forty small wooden drawers, containing a hundred and forty small objects. Each of these drawers, labelled with a foundling’s name and date of arrival, contains the segno belonging to a child. Open them and look in. To Maria Luisa, abandoned on 26 December 1827, belongs a tin medallion, snipped in two. To Aldobrandina, left on 15 January 1862, a sage-green pouch, frayed, and half a Roman coin. Some babies, like Meuri, arrived laden with trinkets and holy icons: in his drawer are heaped a rosary, a snippet of checked cloth, a red leather pouch, half a crucified Christ, and a saint’s medallion on a twist of black thread. In Palmira’s is nothing but a rectangular block of wood (preserved by the Innocenti staff with all the care afforded to Meuri’s riches, all the same). To open the drawers one by one is to be overwhelmed by the volume of such stories, each asking to be heard in the silence within the walls of this place. In Italy, foundlings or descendants of foundlings can be identified by their surnames: Esposito (abandoned), Trovato (found), Incerti (of uncertain origin). In Rome, the most common surname given to foundlings was Proietto, thrown away. Leaving the museum, inhabited by the stories of these foundlings, its famous portico now seemed to hold a new significance, reinforcing that it was built in honour not of prince or Pope, but of the abandoned children of the poor. It’s a place in which that past – in the recorded voices of the foundlings, their portraits and photographs, their segni – still speaks loud. The other new project the institute inaugurated last year, alongside the museum, was – not coincidentally – an emergency centre for the reception of migrant children and families. It’s an old truism that we judge a society by how it cares for its most vulnerable members. Seen in this light, the Innocenti – not the façade, but the building behind it – is one of Florence’s most extraordinary places. And the stories that exist in the shadowy, unobserved corners of our continent –the stories of abandoned children in 1440 and the stories of children who in 2017 cross seas and borders unaccompanied, nameless, unheeded – are, in some ways, the measure of us all. Catherine Banner was born in Cambridge, studied English at Fitzwilliam College, Cambridge, and now lives in Turin. 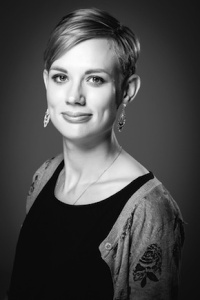 She has taught at schools in the UK and published a trilogy of YA novels. 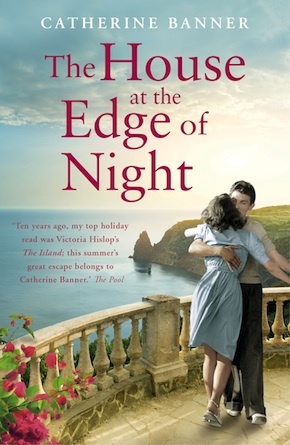 The House at the Edge of Night, her debut adult novel, is out now in paperback and eBook from Windmill Books. Read more.